The seating for the congregation is almost certainly contemporary with the church building. The backs of the seats can be moved to face in either direction. 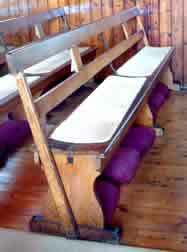 In the past, for Sunday School the backs of alternate rows were moved so that the children could sit in groups. The vicar's desk was given to the church in memory of Reverend Canon Osborn by his daughters in 1903. 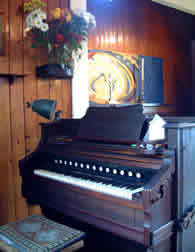 Music for church services is provided by a harmonium. The sound is produced by small pieces of metal, called reeds, which vibrate when air passes over them. Players have to pump air with their feet at the same time as playing the keyboard. This instrument was made in Canada, and was bought by the church in 1926. It replaced an earlier, similar instrument which had been damaged by rats. The church has a 'children's corner' dating from around the 1940s. A selection of childrens books and drawing materials are available for use during services. The Altar, Font and Lectern are contemporary with the building the Altar is built from oak and is thought to have come from an other church because it is much more grand than any of the other furniture in Saint Mary's.